Set in the Meiji era, Kidou Shinsengumi Moeyo Ken tells the story of Kondou Yuuko, Hijikata Toshie and Okita Kaoru. These three are the daughters of former Shinsengumi members and, in the same fashion as their fathers were, they get called upon to protect Japan from its current problems. Much of their work deals with vanquishing the mysterious paranormal phenomena springing up ever more frequently in the Kyoto area and defending the city from any other dangers that may arise. 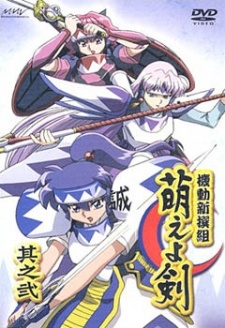 Watch Kidou Shinsengumi Moeyo Ken Episodes Online at Animegg.org. Kidou Shinsengumi Moeyo Ken is available in High Definition only through Animegg.org. Choose an episode below and start watching Kidou Shinsengumi Moeyo Ken in Subbed & Dubbed HD now.